Aircraft manufacturers, automotive OEMs and designers: When rapid production of small batches of complex parts is required, more and more companies are turning to 3D metal printing. However, there are ways for traditional foundries to make friends with the competing manufacturing method. Does the rise of industrial 3D metal printing herald the end of the classic foundry industry? Not at all! On the contrary, foundries have been using 3D printing – the technology of the future – to print casting patterns and moulds for decades so as to remain competitive for the long term. Sales of industrial 3D metal printers have increased exponentially in recent years. Automotive OEMs, aircraft manufacturers and designers all recognise the potential of the manufacturing technology, which enables wafer-thin layers of metal powder to be bonded into components by radiation energy from lasers,. The main advantages: greater design freedom and component densities of more than 99 percent. Designers can print lightweight components with unusual geometries, something that was formerly difficult to produce using traditional metal casting. 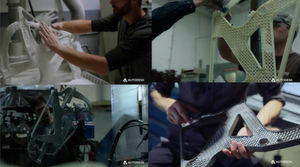 Components produced using a 3D printer don’t just have exciting, futuristic designs – they also come with an enormous practical advantage: They lead to huge cost savings because not only do they optimise the topology, they also enable massive weight reductions and require fewer components and functional enhancements. An example from the aviation industry: if the Airbus A380 aircraft is made just 74.2 kilograms lighter by installing 3D-printed components such as seat belt buckles with honeycomb cut-outs, then, over an aircraft life of 30 years, this represents a reduction in fuel costs of around 6.7 million US dollars. This minor modification translates into savings potential that makes it easy to understand why manufacturers are setting their sights on 3D printing. And foundries? Many think that casting topologically optimised parts is too costly and time-consuming. Customers also generally regard the foundry industry as inflexible and not very innovative, and also sluggish because of long delivery times. This means many foundries are facing an uncertain future. Does this herald the end of classic metal casting? Voxeljet AG was founded in Augsburg, Germany, in 1999 and is a manufacturer of industrial 3D printing systems. The company operates service centres in Germany, India, China, the UK and USA for on-demand production of moulds and models for metal casting. The main uses here are moulds and cores for sandcasting, plastic models for precision casting as well as display models for different industrial purposes. The company’s clientele includes renowned car manufacturers and their suppliers, foundries and innovative companies from the art, architecture and design sectors. 3D metal printing, such as direct metal laser sintering (DMLS), currently only competes with foundries in a relatively small segment. The build spaces of DMLS systems are ideally suited to smaller components. And 3D-printed components for aerospace require time-consuming certification, which metal casting has already had for decades. Direct 3D metal printing is also relatively expensive. This is not only due to the high cost of metal powder, but also the high cost of 3D printers and the comparatively slow building speeds. Components from printers using metal powder usually require manual post-processing after printing. This means support structures and base plates have to be removed. Furthermore, a sintering oven or hot isostatic pressing (HIP) is required to achieve high component density and sufficient resistance. The bottom line is that the average prices of 3D-printed metal components are around €300 per kilogram for aluminium, €400 for stainless steel and up to €1,300 per kilogram for special alloys. As a direct comparison, the price of pure cast steel is around €6.50 to €32 per kilogram. But what happens when, at some stage, 3D technology develops further, build spaces get bigger, materials become cheaper, post-processing becomes automated and technologies become suitable for series production? Will classic foundries be on the way out at that point? Voxeljet is convinced that won’t be the case. Foundries may also be able to manufacture components with complex geometries cost-effectively in small series, thus ensuring their future competitiveness – provided they can build complex moulds faster and more cost-effectively, and without the need for expensive special tools. This is where 3D printing comes into play. 3D printers are able to quickly generate sand moulds using the binder-jetting technology – tooling-free, of course. 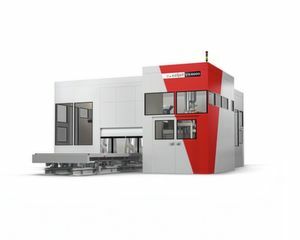 For example, the Voxeljet VX4000, which has a build envelope of 4.000 x 2.000 x 1.000 mm, is the world’s biggest 3D printing system for the production of sand moulds and cores. The system can be used for the rapid automated production of sand casting moulds using the binder-jetting procedure. This means, it prints huge volumes economically thanks to its significantly higher build rates. The industrial platform can produce either many small series or individual, large-volume components. A recoater spreads a 300-micrometre-quartz sand layer on a build platform. The mobile print head then uses commonly used foundry binder to bond the grains of sand in the areas where the sand mould should be created. The construction plan needs to be available in the form of a CAD file. The build platform is then lowered by each layer and the process is repeated until the sand mould is ready. Once the system operators have removed the excess sand from the mould by means of compressed air, it is ready for casting – without any time-consuming, expensive post-processing, unlike components from 3D metal printers. Printed sand casting moulds behave like classical moulds and are sufficiently stable to withstand the harsh demands of metal casting. The binder leads to bending strengths of between 220 and 500 N/cm² of the sand parts – the resistance of conventionally manufactured sand cores. Another major advantage of casting: A much wider variety of materials means light alloys such as magnesium can also be cast. Using 3D printing-supported metal casting means any alloys can be implemented – in contrast to metal printing, which is currently still restricted to few special alloys. The advantages of 3D-printed casting moulds are obvious: Compared to conventional production, they do not require CNC milling or any other special tooling, which can drive up the prices for metal casting. In addition, just as with 3D metal printing, there are fewer restrictions in terms of design. Designers can implement even the most delicate interior geometries with a resolution of up to 600 dpi and do not have to think about demoulding chamfers, separators or indentations. Unlike 3D metal printing, no printed support structures are needed, which waste material. 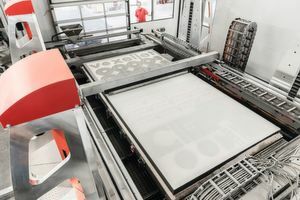 In addition, the Voxeljet printing systems allow several components to be built on top of one other in a single printing process. This saves time and optimises the system´s box utilisation. The materials used in 3D printing have been used in foundries for decades and can be easily combined into hybrid parts (printed and conventionally produced sand parts). Another argument in favour of 3D printing of moulds: time savings. Foundries report that they achieve unprecedented time savings when manufacturing complex sand casting moulds. In addition, metal casting in industries such as aerospace is a qualified and certified process, unlike metal 3D printing. Metal casting is thus a proven manufacturing method that already provides a high level of customer satisfaction, because components of almost any size can be economically manufactured as one component. Binder-jetting is faster and cheaper than most other 3D printing processes. Because the printhead of a VX4000 has more than 25,000 individually controllable nozzles and a printhead width of 1,100 millimetres, the printer is able to achieve build rates of up to 120 litres per hour. In contrast, printers that operate using selective laser melting (SLM) and work with only one laser on a point-by-point basis are much slower. Their build rates are approximately 0.1 litres per hour. The binder-jetting procedure is also cheaper. The average price per litre for sand printed in a service centre is approximately nine euros, while one litre of pressed steel, on the other hand, costs around 3,100 euros. In many applications, such as aerospace components, it is now possible to build almost any size and quantity economically using binder-jetting in combination with metal casting. For example, pumps, drive wheels, exhaust manifolds, housings, frames, large structural components etc. are already being produced using rapid casting. Rapid casting also impressively handles a wide variety of materials – even lightweight alloys such as magnesium can be processed. Metal 3D printing will definitely become more important in the coming years, since printers will become increasingly more powerful and investment costs will fall. By 2020, experts are predicting price reductions of up to 60% for entry-level systems. In that case, additive direct processing of metal powders may actually take a significantly higher share of the foundry’s market, especially for small and medium-sized components. However, it will not completely replace serial casting processes.